“The Square” was inspired by the April 19th Revolution in 1960. Back then,most of the stories about division or war in Korea dealt with individual sadness or tragedies, rather than historical or ideological themes. But “TheSquare,” inspired by the April 19th Revolution presented a clear picture of the ideology that dominated the time period and people chained to the ideology. 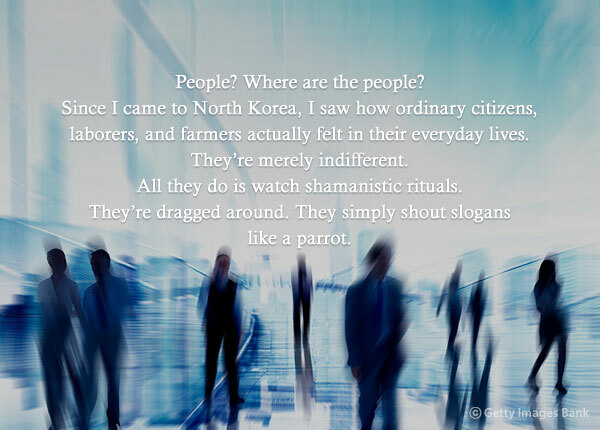 The square of hideous nights, the square of greed, betrayal, and murder, isn’t this the square of Korean politics? Good citizens lock their doors and close their windows. People feel only mistrust for such squares. What they cherish the most is their rooms, their secret rooms. Nobody stays at the square. Once the necessary plundering and fraud come to an end, the square stands empty. The country where the squares are dead, isn’t that South Korea? The squares are empty. 선량한 시민은 오히려 문에 자물쇠를 잠그고 창을 닫고 있어요. 이런 광장들에 대해서 사람들이 가진 느낌이란 불신뿐입니다. 그들이 가장 아끼는 건 자기의 방, 밀실뿐입니다. 필요한 약탈과 사기만 끝나면 광장은 텅 빕니다. 광장이 죽은 곳, 이게 남한이 아닙니까? People? Where are the people? Since I came to North Korea, I saw how ordinary citizens, laborers, and farmers actually felt in their everyday lives. They’re merely indifferent. All they do is watch shamanistic rituals. They’re dragged around. They simply shout slogans like a parrot. 어떤 생활감정을 가지고 살고 있는지 알았습니다. 그들은 앵무새처럼 구호를 외칠 뿐입니다. Do you think Myeong-jun found a square that allowed secret rooms? Or a secret room opened to a square? Choi In-hun must have not wanted others to experience the anguish and tragedy of division that he and Myeong-jun had to live through. Choi In-hun: Born on Apr. 13, 1936 in Hoiryeong, Hamgyeongbuk-do Prov. The Korean War broke out when he ws in high school and his family fled to South Korea. His writing career began in 1959 with the publication of “GREY Club Story” and “Raul’s Story” in literary magazine Jayumunhak. “The Square” was published in 1960 when he was just 24 years old.